Molllust is an operatic metal band who take the genre to a whole new level on their new release Schuld. With a perfect combination of metal and classical elements this band really knows how to take it to the next level. The sum total of having great arrangements, brilliant musicians, and beautiful vocals is one of the symphonic metal releases of the year. The arrangements provide a special atmospheric magic. The musicians provide the skill to execute it and the vocals are simply the icing on the cake. This band is incredibly for such a small unsigned band. They will blow you away! The arrangements are very smooth and show a lot of thought. I love the way that they are mixed together to provide the perfect blend of operatic and metal. While for many symphonic metal bands this combination can be awkward Molllust pulls it off perfectly! Don't think that these guys are Nightwish knock-offs either. They know how to arrange songs in their very own style and many times I think that it comes across better, and smoother than any Nightwish track. I really like the implementation of strings into the mix. In particular I think that having a cello adds a very unique flavor to the songs. In brief, the metal instruments help to accentuate the opera, they give it a crushing power and take the music to a whole new level. The musicians on this album are absolutely stellar. The guitarist seems to have a very solid handle on what he is doing. He adds a lot of energy to the music and helps keep things moving forward with the rhythm section. The bass work is very solid and adds a nice beating hear to the songs. He also helps to keep the music moving forward. Yet it is really the drums that assure constant forward motion in the arrangements. Maybe it is because of the drummer that the album clocks in at a relatively short and manageable 48 minutes. The violin is very nicely implemented with lots of long melodic lines. The same goes for the cello, yet there are bits of ground bass ostinatos to add structure. Finally, the keys add an atmospheric power that really shines in songs like Erinnerungen. Lastly, we have the vocalists. While primarily dominated by a female singer there are also some very solid male vocal lines. While the female vocals mostly provide melodies and epic parts the male bits are mostly there for flavor. The female singer has one of the greatest voices in metal. I love how she caresses your ears with her beautiful and gentle voice. She takes you away to another time, a place dominated by Bach and Handel. The baroque-influence is really interesting and tasty. I get the feeling that live it must be mindblowing to see such a great pair of singers taking the audience by storm. Their music is beautiful and powerful and they realise how to do opera metal properly. 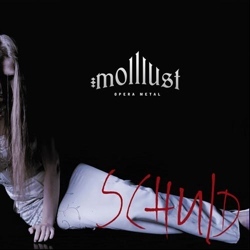 In conclusion, Molllust's Schuld is one of the greatest symphonic metal albums that I have heard in a long time. Staying away from cliches by having excellent arrangements these guys provide interest. Meanwhile the musicians are brilliant and really get how to fit their instruments into the songs. I think that their implementation is really fabulous. Finally, the wonderous soothing vocals are just the icing on the cake. So go check out Molllust they will not disappoint!